Mike and Scattered (our youth/Saturday night band at Cornerstone) lead a youth service at a church in Weber City VA/TN. We took the kids with us and made a little side trip to Sevierville and spent a night at Wilderness at the Smokies. I have to admit I am not a huge fan of Pigeon Forge/Gatlinburg. There is some great shopping there and hiking trails if you get out of the hustle and bustle but mostly I think it is overcrowded and tacky. We got there late on Sunday night – to a very clean, new comfy room and spent all day yesterday at the indoor water park. We had a blast. There were probably only 50 other people there so no waiting in line and once Emma had the wave pool all to herself. 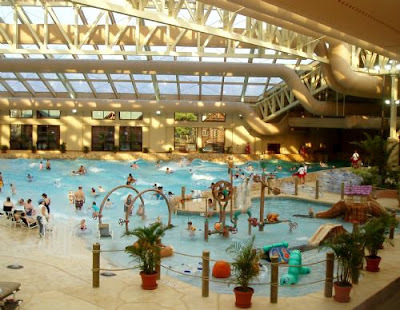 I am sure this summer when they open the outdoor water park and the masses descend on the Smokies there will be long lines and crowded pools – not to mention the room rates double. It was a great little mini vacation for us to spend as a family and a little bit of summer on a cold winter day. Great Wolf Lodge is opening an indoor water park hotel in Charlotte near Concord Mills and the Lowes Motor speedway. Indoor water park fun a little closer to home. It will be open in mid April.